Tiger Bill Reviews Gene Krupa Jazz Legend DVD. Gene Krupa was my first major influence and he was probably responsible for more "DrumHeads" than any other drummer in history. He influenced drummers across all musical styles from Buddy Rich to John Bonham. Buddy, in fact, even cloned Gene's drum and cymbal setup. There was no doubt that Gene was very special. He had a charisma behind the drums that was the equal of any movie star, past or present. In addition to being a terrific showman, Gene was also a very musical player and the first drummer to bring the drumset to the front stage and popularize it as a solo instrument. Gene brought "respect" to the drumming profession. Yet as famous as he was he always remained an extremely humble person, even stating that he wished he could play the drums better. Now that's humility! When I first heard that Gene Krupa: Jazz Legend was being released by Alfred Publishing, I couldn't wait to get my hands on it. Originally released on VHS, this new DVD version is vastly superior due to the many additional never-before-seen clips added and other features that make the DVD format such an ideal educational tool for the drummer's woodshed. Let's check it out. Steve Allen narrates throughout with additional commentary provided by Louie Bellson who knew Gene very well. In fact, Louie first came to fame when he won a Gene Krupa drum contest. Gene was called "Drummer Man" with good reason. As Steve Allen informs us in the introduction, Gene began playing the drums at age 11 not because of a great love for the instrument but simply because they happened to be the cheapest instrument in the music store. (Lucky for us DrumHeads!) But Gene was an innovator right from the start. On his first record date in 1927, he insisted that he be allowed to play the bass drum, which was never recorded before. Thus, Gene became the first drummer to record with a bass drum. Eight years later, Gene joined Benny Goodman's Band and a couple of after that, Benny became known as the "King of Swing" and Krupa became the world famous "Drummer Man" through his incredible featured solo on "Sing, Sing, Sing." Many of you younger DrumHeads might take this for granted but before Gene Krupa came along, extended drum solos were unheard of. Gene was the first drummer to be featured, in the spotlight, playing an extended drum solo and, with his electrifying charisma, he was the perfect DrumHead to pull it off. He did it so well in the Benny Goodman Band that, on March 3rd, 1938, Gene decided to leave Benny and form his own band. Gene's band was an instant hit and the rest is history. Although Steve Allen offers a few insights and major moments of interest in the life of Gene Krupa, the strong point of this DVD is the film footage. The performances span four decades and include an 1967 interview with the legend himself, where he talks about the "new" generation of drummers including Joe Morello! One of my favorite clips is the segment showing Gene teaching Sal Mineo how to imitate the master, which Sal needed to learn for his role as Gene in the Columbia film production, The Gene Krupa Story. Although Sal was a drummer himself, it was Gene who recorded the actual soundtrack for the film while Sal went through the motions, doing an excellent job I might add. (The film is available on video and I suggest you rent it. It's worth the watch for the music alone.) I only wish this DVD contained more footage from the workout session between Gene and Sal. As Steve Allen states, "Gene was the first, and probably the last, jazz drummer in history to be something of a matinee idol appearing in over 20 pictures." Most of those were in the 1940's when Gene was in his prime. Although the 1950's brought with it the end of the Big Band era, it also brought us a wonderful jazz entrepreneur by the name of Norman Grantz with his "Jazz at the Philharmonic" series of concerts. It was Norman who brought together the two drumming legends, Gene Krupa and Buddy Rich, for their popular "Drum Battles." Referring to these battles, Louie Bellson discusses Gene's great natural showmanship and uncanny ability to draw in an audience. As Louie says, "Buddy Rich would play some great, impossible lick and then Gene would follow with a simple fill that would bring the whole house down!" Buddy Rich himself used to complain, "I play all the drums and Gene gets all the applause!" Big Noise from Winnetka: Gene with his trio from 1967. Sing, Sing, Sing: Gene with the Benny Goodman Orchestra from 1937. Avalon: Gene with the Benny Goodman Trio from 1954. Leave Us Leap: Gene's Big Band from 1945 (movie clip). Just A Riff: Gene and "Big" Sid Catlett solo in this 1947 movie clip. Opus #145: Gene's Big Band from 1946 (movie clip). Up An Atom: Gene's Big Band from 1946 (movie clip). Jamming With Gene Krupa: Gene teaches and jams with Sal Mineo during the making of The Gene Krupa Story in this clip from 1959. Caravan: Gene with his trio from 1967. I'm a Ding Dong Daddy from Dumas: An older Gene reunited with the original Benny Goodman Trio in 1972. Sing, Sing, Sing: Gene playing with the Lionel Hampton Orchestra in 1971. Drum Battle: Gene Krupa, Buddy Rich, Lionel Hampton , and Mel Torme (yes, Mel played drums too!) trade solos. This is a great segment from 1971 TV but too short! Additional Vintage Video Footage: Another half dozen performances featuring Gene Krupa over the years with various groups. It also contains a clip from the movie "Follow That Music" where Gene plays a waitor, performing a drum solo on kitchen pots and pans. Vintage Audio Tracks: Eight audio tracks of Gene's drumming covering the years 1945 through 1972. Printable Drum Charts: You can download and print three charts of Gene's performances including Avalon, Leave Us Leap, and Caravan. Additional WB Products: Includes previews of other popular drum DVDs from Alfred Publishing. 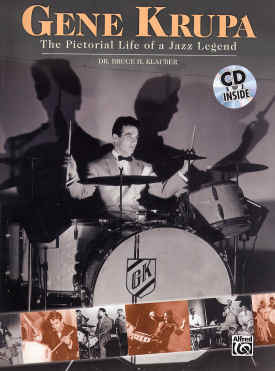 DVD-ROM: When placed in a PC with an Internet link, you gain access to more information on Gene Krupa and other drumming greats. The video and audio clips on this DVD provide us with a good retrospective on one of the most important drummers in the history of the instrument. I thoroughly enjoyed it and highly recommend it for all DrumHeads, regardless of the style of drums you may play. Drummers of all ages should have a firm knowledge of the drumming genius that was Gene Krupa.